On Sunday afternoon, we headed to the West Bank aka Palestine, and again had an amazing new experience for me. It was also pretty impactful for the students as you will read below. 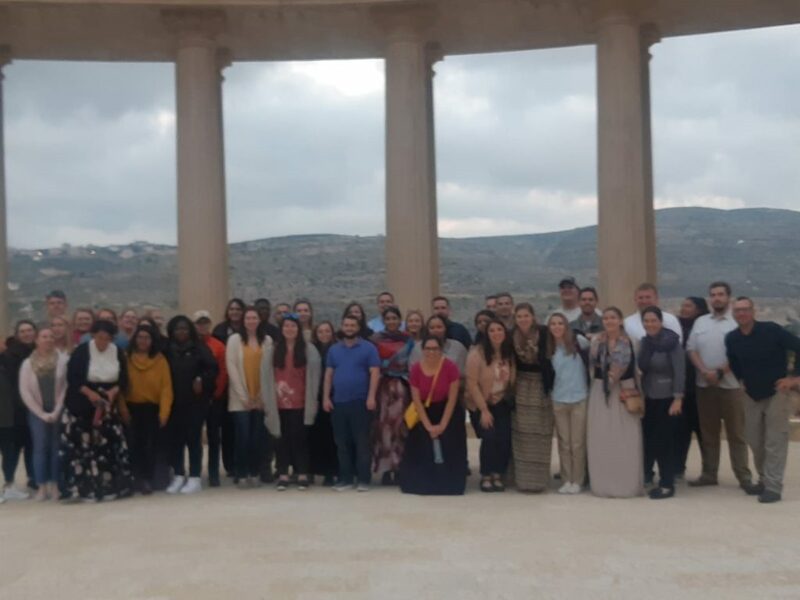 We had with us for the entire afternoon, the very talented Riman Barakat, a Fulbright scholar who completed her studies at Marquette and perennial speaker to our group. As a native of East Jerusalem, Riman also serves as a Director for East Jerusalem and Palestinian Relations for Jerusalem Season of Culture. From someone so invested in the community because it allowed us a realistic understanding of what was going on, which is important when you are trying to understand why there is so much conflict…. Put simply, Ms. Barakat is the Wonder Woman of Palestine. Her resume is awe inspiring, and just listening to her speak about East Jerusalem and Palestine, you feel her passion and commitment for achieving peace to the area. While she is impressive on paper, involving herself with so many great peace seeking organizations, she is even more impressive in person. Having known little about the conflict in East Jerusalem, it was eye opening for me to listen to Ms. Barakat discuss the realities of life in East Jerusalem. It was great to hear from someone so invested in the community because it allowed us a realistic understanding of what was going on, which is important when you are trying to understand why there is so much conflict. It is easy to be on the outside looking in and develop an opinion on the conflict going on, but until you truly get an understanding of life and the people there, you realize you really don’t know what you are talking about. Her views on embracing both sides of the community and coming together to find peace could not have been a better tone to set as we crossed the Green Line, into Palestine… Our trip to the West Bank was one I will never forget. To have the opportunity to see, first hand, the realities that plague Palestinians, really puts one’s understanding of the conflict in a different perspective….I came back from the trip, and every person I talked to, I wanted to set the record straight on what Palestine is like, and how important it is to support peace, but not to get so engrossed in thinking we can fix it for them. The discussion should be between Israel and Palestine. The United States can and should help facilitate that relationship, but we need to understand our place. I left with a new perspective and a new sense of hope for Palestine. I am not sure what more I can do with that right now, but I will continue to share my experience and educate others as best I can. This was truly a once in a lifetime experience, and I am beyond grateful to have had [it]. 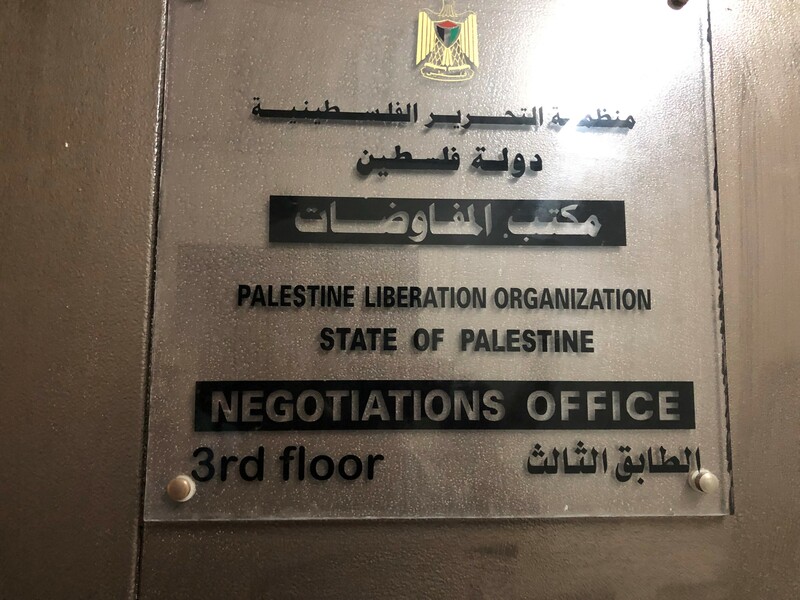 Our first stop was to meet with Saeb Erekat, the lead negotiator for Palestinian Authority, who has participated in all of the major peace talks for over 20 years. I was delighted to meet him after hearing about him for so long. 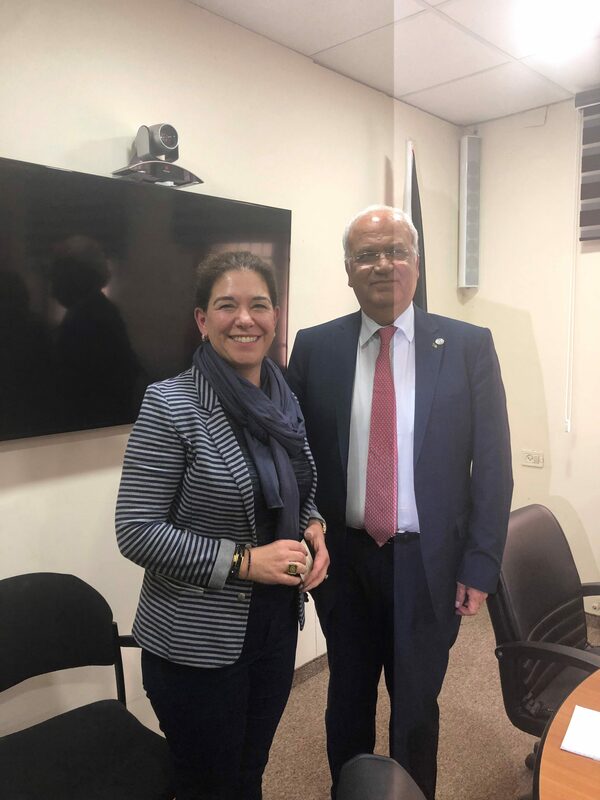 Nothing, until that point, compared to the moment we met Saeb Erekat…he struck a chord with many of us. [He] wants American’s to get out of the negotiation between Palestine and Israel. As an American who spent her entire undergraduate career trying to find ways to solve this conflict, I’ll admit that one stung a bit. To see people as separate from their religion, nationality, or race – as human with families, aspirations, and basic needs, including the need for security…Mr. Erekat said “We have good people, we have bad people. We have honest people, we have dishonest people.” Often, our own understanding of foreign nations and their people derives from the rhetoric of our own government and media, which can lead to the misconception and denigration of those with different values, beliefs, and ideas…After all, it is only by understanding others through our commonalities, rather than by our differences, that people of varying belief systems can co-exist in a manner that is both peaceful and just. The city of Rawabi was unlike any other city I’ve ever seen. Driving into the city going over rolling hills and winding roads, you overlook a swath of massive san-colored buildings, many of which were high-rise, high-occupancy residences in various stages of development, as well as a gorgeous nearly-completed mosque. Upon first glance, it seems to be like a rather typical urban setting on the rise. However, after getting out of the bus and walking around, the city seemed almost empty, devoid of actual residents…[it was] trying very hard to [be an] oasis in the desert when it may all very well be just a mirage. Below is a picture of the group at the brand new coliseum…I’ll be very curious to see how this city develops in the future.